Friday, 17 July 2015, 400m2 of the Canossian Professional Centre for Formation building, La Plata, have been burnt down. 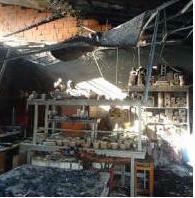 The laboratories of informatics, ceramics, fashion, electricity … were completely destroyed. 400 young girls and boys, and adults are on the street, with a big uncertainty about concluding the basic courses to find a job.